Suicide. It’s a topic most people tend to avoid talking about—it’s dark, it’s scary, and it’s the 10th leading cause of death in America. These are all the reasons why director Lisa Klein confronts it. Her documentary The S Word chronicles the journeys and stories of survivors of suicide attempts. According to Klein, who lost both her brother and father to suicide, the documentary is about “life, not death,” and seeks to bring mental illness and suicide to the forefront of conversations nationwide. 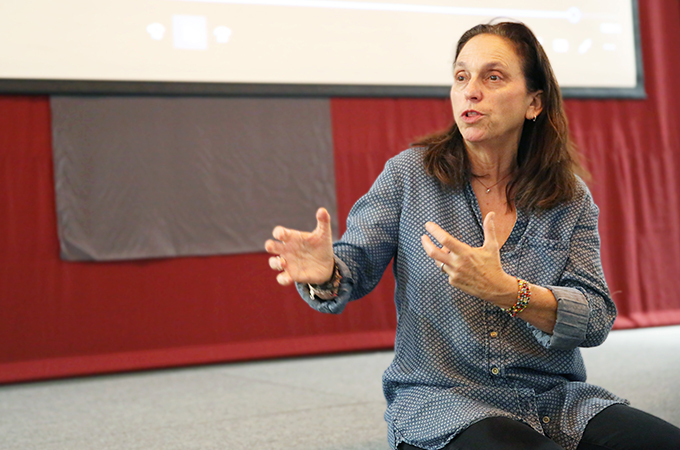 On September 12, the University’s Alliance for Community Transformation and Wellness hosted a screening of the documentary, which has been on national tour, followed by a Q&A session with Klein. Here are excerpts (edited for content and clarity) from that exchange. Q: What steps can community advisors take to help students in situations similar to those presented in the documentary? Klein: Have places where people can talk. While there are all kinds of social media, there's a lot to be said about being in the room, being with people, connecting, and feeling less alone... I can't stress enough how important that is to be able to say, “We're going to meet,” how however many times a week, “We're going to get together and we're really going to be able to talk about stuff, about anything,” and to connect with people you know. When you form clubs or groups, have each other's backs. If you do have a club with 11 people and 10 show up on, you want to be aware of who isn't there and why. It's work, but it's also connection. Q: How do we help parents to talk to their kids now, because everyone is so connected to their phone and their fast-paced life? That's a huge thing I'm trying to work on now, too. The 800 numbers and the tech side, all that’s downstream. We're talking about upstream, getting to people before they're in crisis mode, before they're on that ledge. I tell this story about a teacher in the Midwest who, right after the Columbine shooting in 1999, started asking her fourth graders every Friday, “Who did you have lunch with this week? Who are you going to play with this weekend?” Then she looks at that information and sees who is not included. Those are the kids she starts focusing on, making sure that Jason has somebody to sit with at lunch and so on. Talking to teachers and parents [is important], because emotional health is not part of the curriculum. It's great to learn the ABCs, but emotional intelligence [helps kids] deal with what's happening. Parents [should] pay attention to whether their kid has anybody to play with, too. None of this is easy, but it's really about paying attention and just rolling up your sleeves and getting into that stuff. Q: For students who are wondering how to bring up [suicide], what's the best way to get around the taboo? That's exactly what we're trying to do with the film, because suicide is a huge problem. There's no question it's awful; the silence around it is just as bad. So picture carrying that around with you, and add to that you can't talk about it. We have to [talk about it] because not talking about it is killing people. How do we get in there? How do we talk to these parents? I think getting in through the schools is our inroad. We have to have the conversation about mental health in general. We have all the stats. We know [suicide is the] 10th leading cause of death, and we know it’s the second leading cause of death for 15- to 34-year-olds. Suicide is one of the few things that does not discriminate. We've seen it with our celebrities or sports figures, our friends, our family... It is so incredibly pervasive—not in a good way. We have to get that point across [that] it really is changing society. We have changed a lot of hearts and minds so it is not taboo. This person's not the “other”; they’re your son or daughter or sister or brother. Q: Do you think it's important to ask if they don’t want to live or is that putting the emphasis on whether life or death is better? I really do [think it is important to ask]. A lot of people are afraid of the question “Are you thinking about suicide?” but I can tell you, just from experience, [that people don’t think of suicide] because you mentioned it. It doesn't work that way. The flip side of that is suicide is an option. You don't want it to be, but it is. But let's think of five other options. Let's think of five other things that make you want to live, that you're excited about, whatever it may be. Even if it only gets you to the next day, that gives you time to work on it. If you or someone you know is struggling with suicidal ideation, the National Suicide Prevention Lifeline can be reached at 1-800-273-8255. For the U of R community, the University Counseling Center provides free and confidential mental health services and can be reached at 909-748-8108; its after-hours crisis line is 909-748-8960.